We have located the following history of the wharf written by the late Bill Hilder in the late 1960’s. My thanks to the Hilder family for allowing us to use this article. The question agitating our minds today is, are we to keep our wharf, or stand by and see it pulled down? Its fate rests primarily with our Borough Council, the Harbour Board, and the R.N.Z.A.F. But please note that public opinion, reinforced with public action has a big influence on the final decisions of public bodies. You may wonder why a wharf was needed so long ago. By 1887 there were quite a number of settlers this side of Verrans Corner in what was then known as the Hellyers Creek area. They were mostly in Birkdale Road and down where the Ranch House now stands. Roads from here to Birkenhead were non-existent or barely-usable clay tracks, and water transport was the easiest and logical means to get from place to place, and was then used all over the Waitamata Harbour and beyond. Come on a quick trip with me. I see some of the places that depended on water transport: Down Mission Bay way before the waterfront road was built, 0rakei, Kohimarama and St. Helliers Bay had a ferry service run by the Devonport Ferry Company. Beyond there boats ran for cargo and passengers from Panmure and Howick, Whitford, Beachlands, Clevedon and Thames. Down the East Coast Bays there were wharves at Takapuna, Murrays Bay, Browns Bay, Torbay, Arkles Bay, and up the Wade River to Silverdale, also to Waiwera, Puhoi and Warkworth. Inside the Harbour, ferries were a necessity. 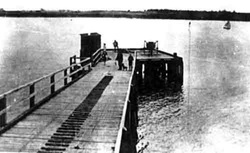 Even Ponsonby had a wharf on the Herne Bay side of the Harbour Bridge, and Ponsonby and Herne Bay residents went to town by boat. Coming back to our own Upper Harbour boats and services. This was a busy waterway over a hundred years ago, and had a lot of industries. Kauri logs and timber from Lucas and Henderson Creeks; brick and pipe yards flourished in many places and hundreds of tons of kauri gum was carted by boat. At Riverhead, a flour mill was operating in 1854, and the paper mills followed in 1900. Then came the settlers; fruit and strawberry growers at Riverhead, Riverlea and Albany, Paremoremo, Waimarie (as Whenuapai was then called), Greenhithe, Birkdale and Island Bay, and they all wanted boats to carry their goods and passengers. When I first knew this area, Brodney & Binns had three steamers on the run. Hunters from Greenhithe had two launches, and a special launch from Beach Haven subsidised by the Land Company. All those have now gone, but we still need our wharf for recreation and to tie in with the new development scheme brought forward by Mr. Larking, and it is up to YOU as a swimmer, boatman, or a resident to do something about the matter.